I want to be able to have fun wherever I am. I want to laugh. All. The. Time. I want to have one holiday every year with my family where we have no plans and nowhere else to be. I want to watch less television and read more books. I want to be able to whinge about never being able to be alone any more, then, after someone organises a hotel room voucher for me, I want to spend the evening eating chips (that I don't like) from a cylinder and missing my children to the point of tears. 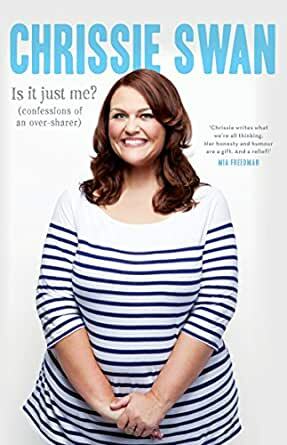 From weight to wee, children to crap dates, nothing is off limits for Chrissie Swan, self-confessed 'over-sharer'. Celebrity, friendship, love, being a working mum, 'having it all' and the general chaos of life – Is It Just Me? is Chrissie at her hilarious, candid and fearless best. Chrissie Swan is host of Can of Worms and co-host of MIX 101.1’s breakfast show in Melbourne and The 3pm Pick-Up nationally. 5.0 out of 5 stars"......but the truth is, I'm kinda boring"
I only downloaded this a couple of hours ago and still have plenty to read, but really have to give it five stars. Chrissie Swan NO WAY ARE YOU KINDA BORING! Being a series of essays means you could read in instalments, but I challenge any reader to do that. There have been tv shows I would certainly not have bothered with except for Chrissie's infectious personality (okay not Big Brother under any circumstances!) and it translates to the page. I would encourage anyone to grab this while it is cheap and enjoy the ride. This book is a series of columns written by a bubbly, charismatic and very likable person. They cover just a few themes and don't really add much to each or build up to any great "over-share" over the course of the book. Because they were columns, they are written for a certain type of editor and audience so everything is safe and cheerful and never goes very deep. I did enjoy reading but got through this very quickly and wasn't left particularly moved, particularly when some of the columns seemed to be sponsored by advertisers with brand names popping up without any subtlety. What a lovely gift to be able to write in this warm intimate style. Thank you for sharing your take on life, I wish I could have a coffee with you, I know I would enjoy the time. 3.0 out of 5 starsIt's Okay, Fabulous Gal though.. The book felt a bit outdated and Chrissie was reluctant to share the "real" stuff... Really just a gathering of her columns, Would have preferred a book rather than a "collection" of writings..